My husband’s mother Judith was a wonderful cook. She was a sixth-generation Sephardic Jew from Israel, born on Carmel Mountain in Haifa. Judith was first and foremost a family woman who devoted her life to creating a warm and cozy home. She would spend her days in the kitchen and tending the vegetable garden, providing nurturing sustenance for her family. She cooked on a tiny tin stove and made everything from scratch. Her kitchen was full of love. Unfortunately, I never had a chance to meet Judith. She passed away before I came into my husband’s life. Despite this, I still feel her presence strongly in our home, especially when we have family gatherings. Everybody speaks of the amazing meals she cooked, how she would spend hours and hours preparing a single meal. It amazes me how food has this power to pass on positive energy. A meal made with love can go on living long after the chef who created it is gone. My husband’s sister Mooshi takes after her mom. She cooks with love and care, recreating Judith’s beloved dishes as well as her own creations. Last week, she shared a couple of her favorite eggplant recipes with me. 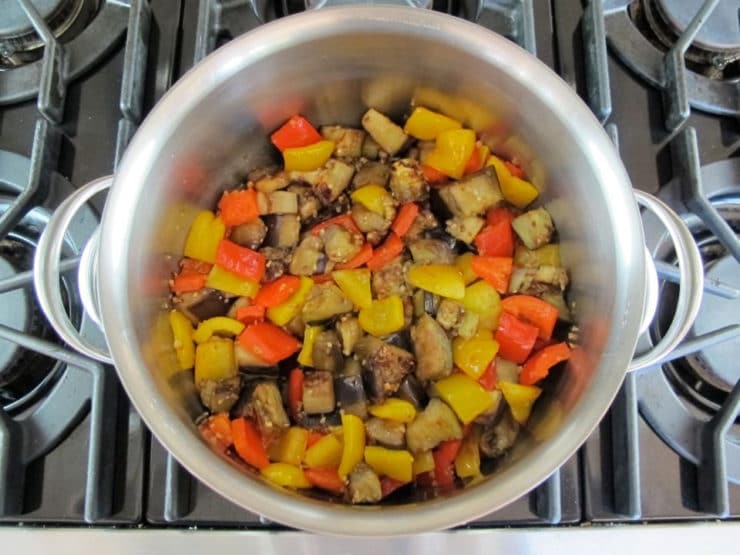 I especially loved the following recipe, a cooked eggplant salad with peppers and tomatoes. It’s healthy and surprisingly filling, without any added meat or dairy. 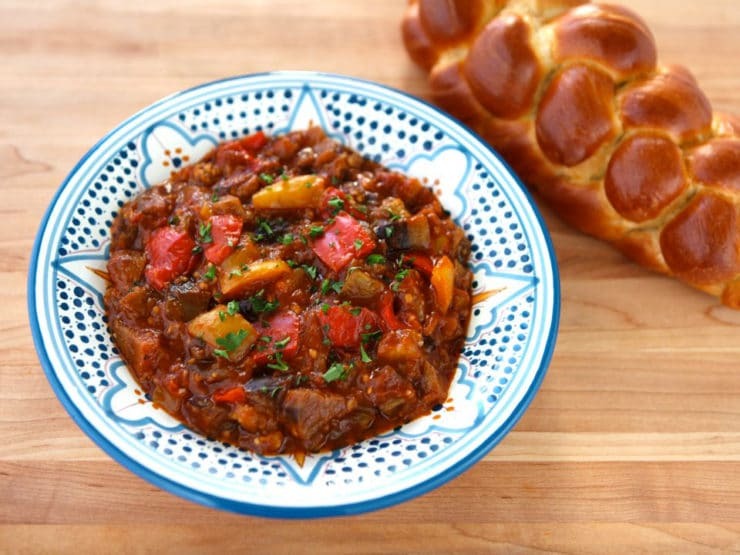 It’s meant to be served with bread, like challah– the bread can be dipped into the delicious sauce. As we cooked, Mooshi explained to me that eggplant was a staple in their childhood home. Judith often cooked eggplant because it was widely available and inexpensive. Both Mooshi and my husband adore eggplant, and now I understand why. It reminds them of Judith, of mom, of home. I hope you will enjoy this simple recipe as much as we do! Note: If you’re gluten free, you can enjoy this recipe on its own or served as a vegan stew over rice or quinoa. Healthy vegan cooked salad recipe from Israel with eggplant, peppers and tomato sauce. Kosher, Pareve, vegetarian, diet friendly, gluten free. 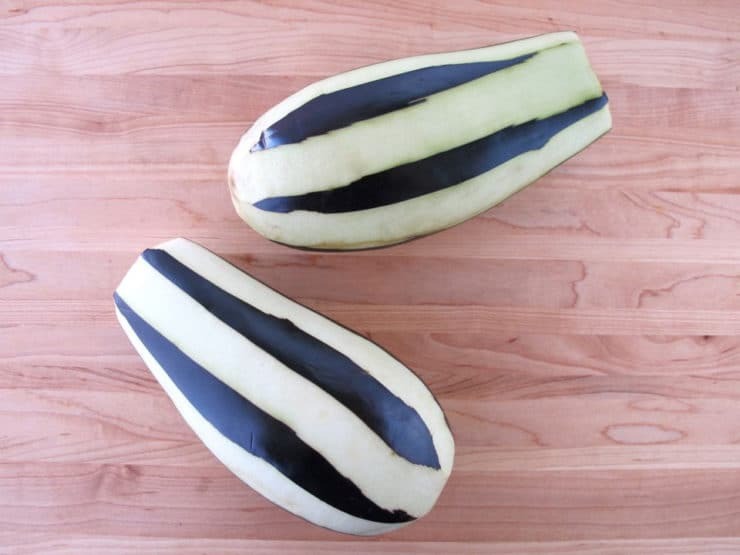 Peel the eggplant in stripes, keeping a few strips of skin intact so they run down the sides of the eggplant vertically. These strips of skin will help to hold the chunks of eggplant together; they also add flavor. Heat 2 tbsp olive oil in a large skillet over medium. Cut the eggplant into 1-inch chunks. Put half of the chunks into the skillet and let them fry for about 10 minutes. When the cubes begin to turn golden brown, transfer them to a larger pot. Add 2 tbsp of olive oil to the skillet and fry the second batch of eggplant chunks the same way, for about 10 minutes till golden brown. Transfer the chunks to the large pot. 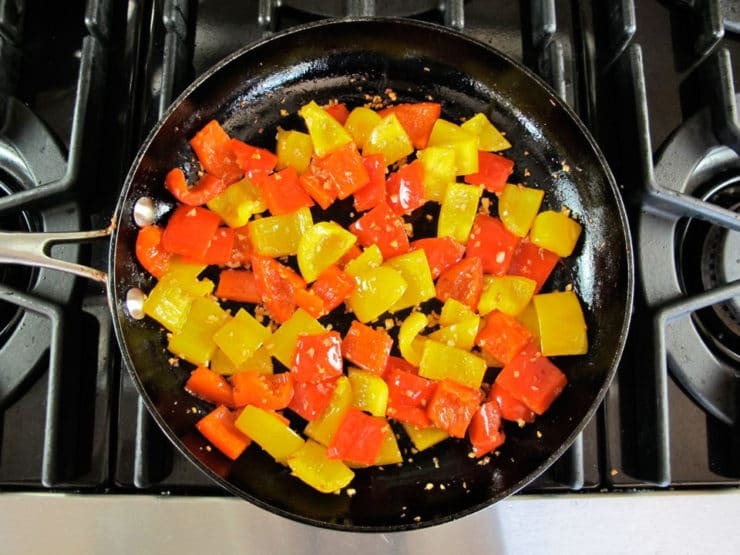 Add 2 tbsp of olive oil to the skillet and add the bell pepper chunks. Let them fry for about 3 minutes. Add the minced garlic and continue to fry for 2 more minutes, till the garlic is fragrant. Transfer peppers and garlic to the large pot. 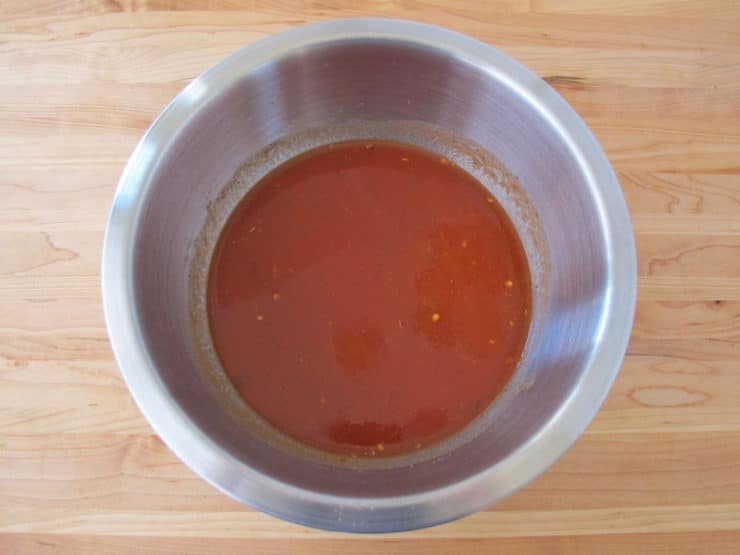 In a mixing bowl, whisk together the tomato sauce, water, cumin, salt, sugar, crushed red pepper flakes and black pepper. Pour the liquid mixture into the large pot and bring all ingredients to a boil. Reduce heat to a medium-low simmer and cover the pot, leaving a small gap open to vent. Let the mixture slowly simmer for 1 hour till sauce is thickened and reduced. Remove from heat. This cooked salad can be served hot or cold depending on preference. Our family enjoys it at room temperature. You can serve it with freshly baked bread if you wish. If you’re gluten free, you can enjoy this recipe on its own or served as a vegan stew over rice or quinoa. i abolutely love this salad, we’ve been making it for about 25 years as well. We also add a bit of cilantro on the top when serving, and serve it with middle eastern flat bread! Love that there’s nutritional info! Cant wait to try the sheet pan method others used in the comments!! Loved eating this on my recent visit to Israel. Made today and ate it warm with steak. Delicious! Couldn’t wait to let you know! TY for such a wonderful recipe. Yum! We baked the eggplant on a sheet pan instead of frying and it came out great. I just did the same thing!! Saved time and also less oil. I’m on a very restricted diet. Weighed and measured food. I can measure a little oil for a serving or have olives with it instead. Fabulous recipes!!! I discovered this dish a couple of months ago and have now made it too many times to count! I almost always have some in my fridge. I often eat it with pasta or have it on toast for breakfast! Made this today (after trying to recreate a dish I had in Turkey in the 80s for all this time without success) This is the nearest to the tastes and textures that I remember thank you! I initially made it without the sugar or salt but it was quite bitter so added them in and cooked for a bit longer and was really lovely. Had it with warmed flatbreads and had let the recipe cool. I had sprinkled salt over the chopped aubergine and let it stand over night then gave it a quick rinse. I also cooked the peppers in the oven for a while before adding to the pan with the browned aubergine. I couldn’t get flaked peppers so used a teaspoon of a middle eastern mix with various ingredients including chillies and cumin then added another half teaspoon of cumin. Thank you again for the recipe – fab! Hi All , this is the best recipes and my family love it .I spice up more with red chillies and i cook eggplant and peppers in the oven . I love the way eggplant coming out from the oven ,its perfectly cooked ,do not forget to mix it . This was delicious!! 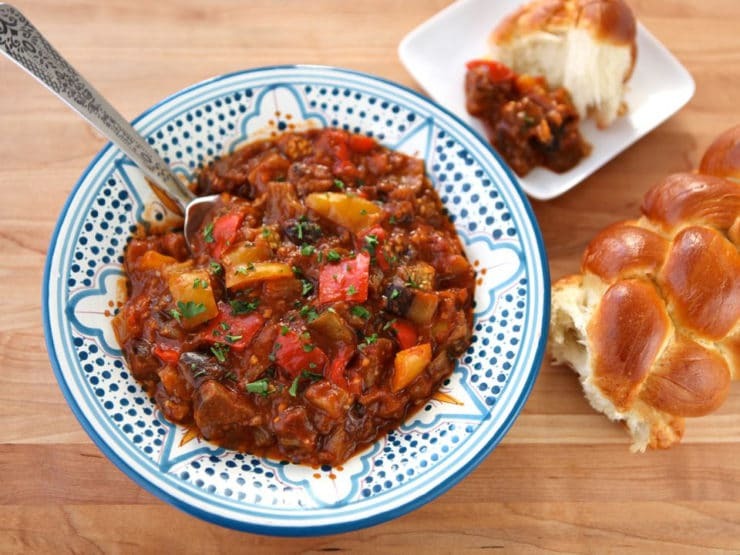 Served it on Shabbos with challah and dips and we couldn’t get enough! It was easy and delicious! I love love love the flavors. Thank you. Can I give this recipe a million stars? I wish that was an option. Let me tell you, I made this recipe and my entire family keeps asking me to make it again. Even family members that absolutely cannot stand eggplant in any form, were asking for a second taste. I spiced it to make it more “Israeli”. I added: 1/2 tsp smoked paprika, 1/2 tsp cayenne chilly powder, 1/2 tsp smoked chilly flakes paprika mixture (I used the one from Victoria gourmet), 1/2 tsp curry, 1/4 tsp tumaric. It was not spicy at all, and family members that don’t like spicy food enjoyed the little kick of flavor. I used to buy this salad in Israeli grocery stores, and I am glad that I finally found the recipe for this salad. I made this for dinner last night and it was fantastic! I thought it had the perfect amount of spice to it. We ate it warm with bread. I love this recipe I have made it so many times now, it always goes down well and so easy to make. Love your recipes Tori. Followed recipe exactly, the eggplant wasn’t as soft as I would have liked them to be. Sorry to hear that Bella. Next time you can try cooking it a bit longer (if it seems to be getting dry add water as needed), or you can cut the eggplant pieces a bit smaller. This will help to soften them up more quickly. I hope you enjoyed the flavor! I really like this recipe even though it’s very time consuming to make. I added extra garlic and also before serving, I stirred chopped fresh dill and coriander. The fresh herbs made it taste WAY better. I’d definitely recommend adding them. Made exactly as directed, and let me tell you – this is AMAZING! We ate it warm just off of the stove, because we were hungry. Served with a sourdough bread. Can’t wait to make it again! Thanks for a great recipe! Chilling now for our Shabbat dinner this evening – couldn’t get enough of the sample tastes! YUMMY! healthy amd delicious. i made it for a mediterranean themed dinner party with your chicken shawarma , tabouleh, hummus amd tahini sauce recipes and all were delicious. rave reviews from all guests. Hi, Tori, I was looking for a middle-eastern recipe for my shul’s Sukkot potluck tonight. This is perfect! 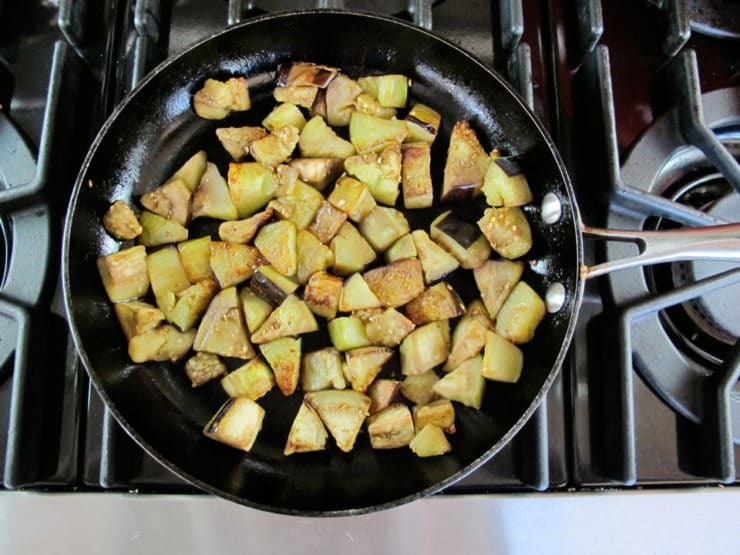 I made a few minor changes – I subbed zucchini for one eggplant, roasted the eggplant and squash using your method, used olive oil pan spray, and omitted the sugar (roasting seems to sweeten the vegetables). It’s a beautiful dish and as I’ve just tested it, delicious! My husband agrees. Great Lisa! Chag Sukkot Sameach. 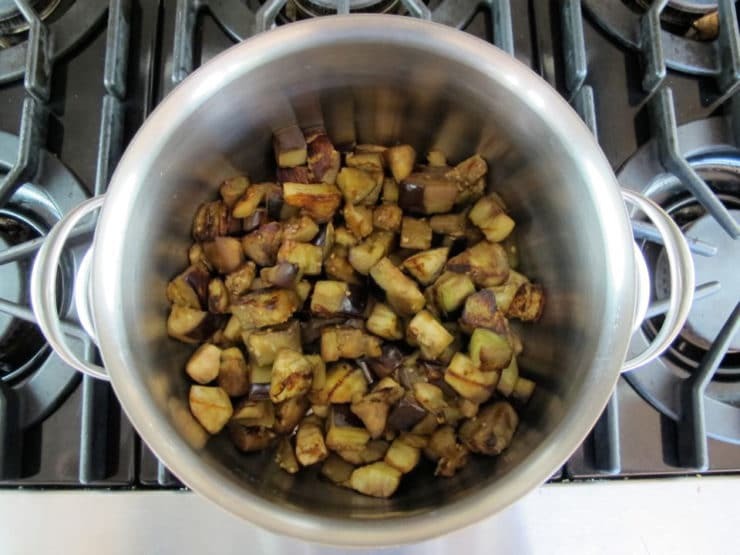 After having tasted Rebbetzin Rachel Druk’s eggplant salad in Cancun recently, I was most eager to find a recipe like hers. Yours filled the bill. It’s delicious. Can’t wait to try some of you other recipes. I’m hosting my very first seder tomorrow night! Can I make this recipe today and serve it tomorrow? Fab recipe! I want to make this to serve at my seder (night #2), but we are going to be at my in-laws the weekend before and for night #1. Can I make it the week before and then freeze it? Or will it hold for 5 days? Any ideas? Hi Mia! I have never frozen this before, so no promises, but I think it will probably freeze well. What I would do is cook it for 45 minutes (instead of an hour), then after defrosting reheat and let it continue to cook for a final 10-15 minutes till thickened and reduced. This way it won’t overcook when reheating. Enjoy! Hi, we make it all the time. Made it for Pesach and had a lot left over, it froze and thawed perfectly. This was delicious! I had leftover roasted eggplant cubes from an eggplant buying binge–there was a big sale! I made this a couple days after roasting the eggplant, and it was a huge hit with my husband and 19 month old. Served over Brown rice for them and spaghetti squash for me. Thank you! Hi Sara, salting is done to remove bitterness from eggplants. Most eggplants aren’t naturally bitter, but every once in a while you might run across a bitter one. If you are concerned about it, you can certainly salt the eggplant before making this dish. Best to let it stand for at least 1/2 hour, until lots of moisture droplets bead on the eggplant flesh. Just be sure to rinse the eggplant well to get rid of excess salt and pat the eggplant pieces dry before proceeding with the recipe. It is delicious but I used WAY more oil than you. It just kept soaking it up and I was afraid it would burn so I added more. How did you manage to use so little and getting it still to brown? Hi Debbie– try using a nonstick skillet for the frying step, that should help. 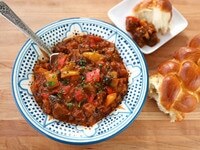 Cooking this right now for Shabbat dinner! Just wanted to let you know there is a blogger who is passing this off as her own on facebook. Thanks Abby, I have filed a complaint with Facebook. I appreciate the heads up! Thanks for the very precise recipe. We just returned from Turkey where we ate variations of this dish at several restaurants and loved all of them! After looking through several recipes online I decided to try yours. It’s a hit!!! I used Sprouts Salt-free tomato paste and added 3 cups of water to bring it to the same volume as your recipe. Also added one small green cayenne pepper diced. Increased the cumin to 2 tsp and used Antep red pepper flakes that I bought in Turkey. Absolutely smashing! Ha! Just bought eggplant and red pepper for a family gathering with nothing in particular in mind. I now know exactly what I will do with it. This looks delicious! I’m so glad I came accross this web site! Along with this I’m marinating the chicken shawarma to go on the grill. Sounds like an awesome dinner to me! Wow..this looks great. I have to bring a dairy dish to synagogue on Saturday night for their “Spiritual Nosh” and I’m trying to decide on this eggplant dish (which I haven’t made yet) or the matbucha which I have made and is delicious). Can this be served OK on the same day or does the flavor set in after a day in the refrigerator? Is this eggplant dish good to eat with pita bread? Hi Dave, great question. They’re both yummy! The eggplant is very good served the same day, and great with pita bread– but the matbucha is more dip-like, and might be better with pita bread as part of a potluck. I also think the matbucha is more of a “wow” dish, it has so many flavors in it… but again, both are delish. It’s really up to you! Thanks, Tori. I actually decided on the matbucha anyway! In Richmond I’m not sure eggplant coming in is local and fresh (or cheap!) as it will be in another month. And when I made the matbucha last time it was SO good! I also want to say that you are one of the few people who has made it ‘big’ yet still responds to blog posts and questions. It’s really appreciated. It must take a huge amount of time…but you are so good at all this! I try my best! It’s not always possible to answer every question, especially when things get busy, but I really try to respond when I can… I consider you all my “cooking friends,” and I love chatting with all of you! A couple of times I mashed it with a wooden spoon to make it more dip like. It was great. I was thinking instead of tomato sauce from can, I could use fresh tomatoes and grate them without grating the skin. In such a way tomato would be fresh. My grandmother cooks some dishes with zucchini and some with peppers like that. Hi Tori – please could you tell me what tomato sauce you use for this recipe? Is it just canned crushed tomatoes? I’m not from north America so I never know exactly what people are referring to when they say ‘tomato sauce’ – where I’m from, it means ketchup! Thanks! Hi Amanda, tomato sauce is sauce made from pureed tomatoes, slightly reduced and thickened. It’s very common here in the U.S. If you can’t find it where you live, you can buy canned crushed tomatoes. Puree them in a blender till smooth, it will provide a workable substitute. Just found your blog and this recipe today. Am planning on making it tonight. Could u do the simmering in a slow cooker instead? Also am planning on throwing in some ledtover roasted chicken and serving over rice and instead of challah, making parathas. Mmmmm…. It should work fine, but I’ve never tried it myself. Do you want to cook it overnight? If yes, set it on low and keep an eye on the liquid levels to make sure it doesn’t get dry or overdone. Enjoy! I was so excited to see this recipe! I make a dish this very same dish with chickpeas added. Love it! Do you think this can be canned? I just made this tonight and have to say it’s one of the best recipes I’ve tried online. This recipe looks and sounds delicious. When my uncle died my cousin had several different kinds of this salad. One was better than the next. Several different people had brought them to the house. I wish I had paid more attention to the brands. When my cousin came to visit me here in North Carolina she brought me some from New York. It just wasn’t the right one. So I hoping this is the ONE! It looks sooooo good. Had a lot of eggplant from my garden, made Mooshi’s dish and it was excellent. Can’t wait to serve to my cousins from Israel, I bet they will be just as impressed as I was. You have great recipes and love trying them all. Your hamemtassen recipe was a very big hit..I used guava for the filling and was great. Keep them coming. I am sure your mother-law is looking down at you with so much love and happiness in her heart. Her son lucked out. Thanks – looks wonderful. 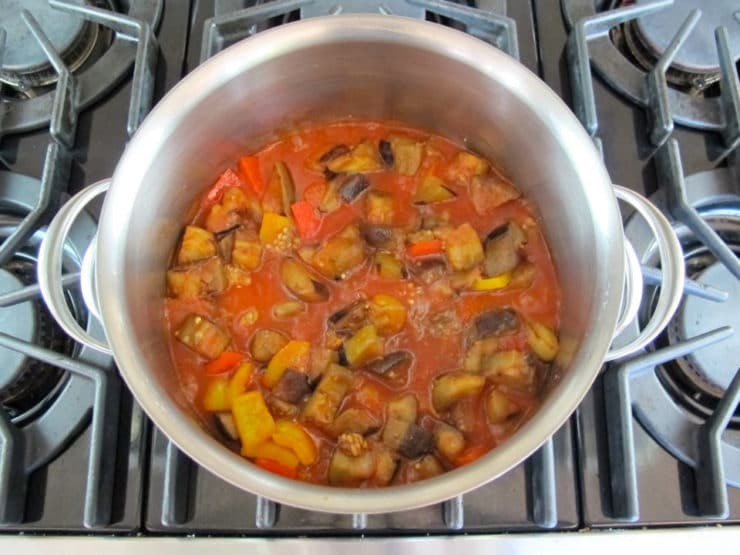 I love eggplant and will try, God willing, this variations to my usual “red” eggplant salad. Thanks. And you find that the eggplant needs the full hour to cook? It does sound delicious, with the pepper flakes and cumin as flavorings for the tomato sauce. I enjoyed the story and the nice photos. The eggplant salad sounds very good. Any idea why you need to add water? Hi Faye– this is the way Mooshi makes it, and it always comes out perfectly. I think the water loosens the sauce a bit. With that slow cooking for 1 hour, the sauce reduces quite a bit and the eggplant gets very soft. I think it would be overly thick without the water to help the texture. Hope you get a chance to try it! Oh boy, does this sound (and look) good!!!! I’m printing it and will make it soon. I think I’ve printed out every one of your recipes, Tori!